Facial reflexology has all the holistic health benefits of foot reflexology, with some added unique therapeutic benefits. The treatment will help your body to function at its optimal level, with one side effect...a younger, more radiant and glowing complexion. Promoting the production of new skin tissue, it can help to improve skin tone by releasing muscle tension and improving circulation. Facial reflexology focuses on pressure points on the face, to stimulate the body's self healing abilities and balance the entire body. The face's close proximity to the brain and cranial nerves, make Facial reflexology very powerful yet gentle in impacting the body's systems, resulting in good health and looks. 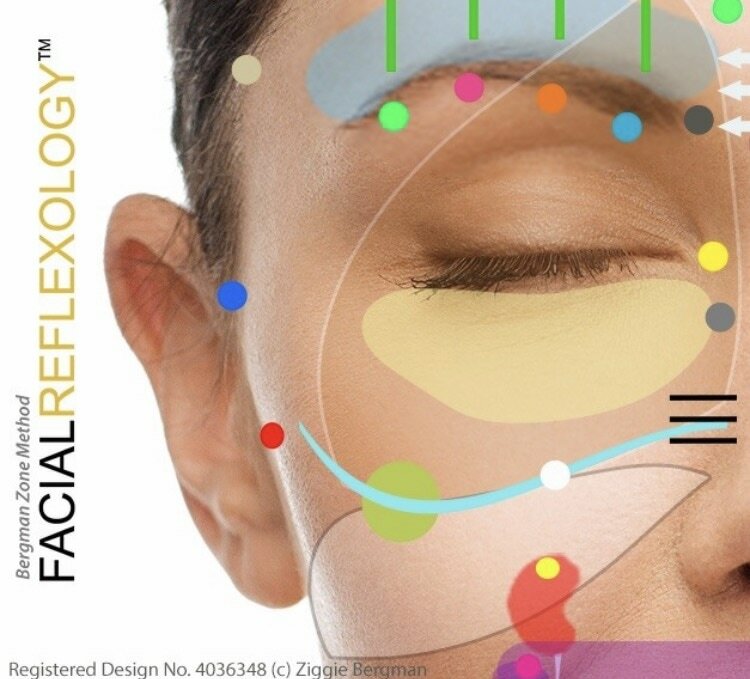 I have been trained by renowned reflexologist Ziggie Bergman, founder of 'The Bergman Method of Facial Reflexology' and 'The Zone Face Lift' at The London School of Reflexology. The Bergman Method has been developed over 20 years and is based on zone therapy, combining Native American healing techniques and Asian body mapping.